Even trace amounts of flammable material are dangerous! 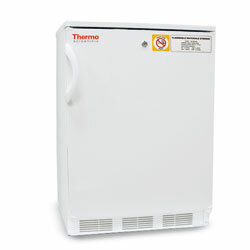 Ensure safe cold storage of volatile materials with these flammable storage refrigerators. They’re engineered without internal electrical components that could trigger an explosion. Choose from 5.6 ft3 and 21 ft3 capacity models. Both feature a manual defrost and spark-free interior that minimize the risk of internal explosion. They have four adjustable shelves, a tough white exterior and key lock. Refrigeration system and insulation are CFC- and HCFC-free. The 21-ft3 model (stock # 50676) features a corrosion-resistant interior, with stainless steel interior door liner and shelves. Both refrigerators meet OSHA 29CFR 1910.307 and NFPA 45 and 99 requirements.